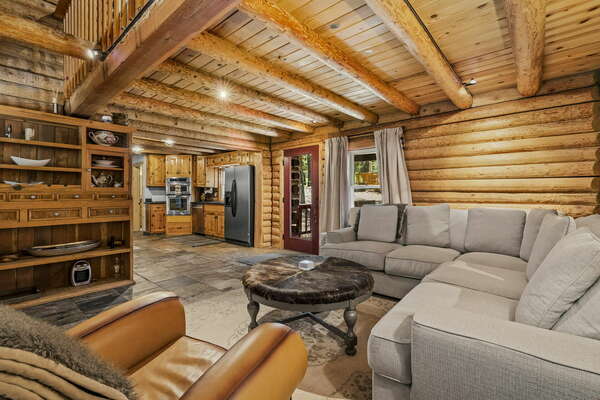 Our beautiful Tahoe Donner Vacation Lodge features 4 bedroom, 4 bathroom and a loft, with an open concept living, dining, kitchen, this spacious lodge makes it for a perfect family(group) getaway. As you step inside, you'll be welcomed by a beautiful foyer that leads to the open living area with a magnificent stone fireplace, gather round for an evening of movies, games with the family or just enjoy the peace and tranquility in the mountains. On the same floor, you'll find a full bathroom, as well as, a master suite. Head up to the second floor where you'll find another master suite, 2 more bedrooms with a shared full bath and the loft. Take a step out onto one of the decks and enjoy your morning coffee or a BBQ dinner while you take in the serenity of the mountains and views all around you. The back yard is especially peaceful with the surrounding trees and greenbelt that the property backs up to. All the convenient outdoor furniture allows for everyone to spread around, get comfortable and create memories of a lifetime. You are within easy access to Sugar Bowl, Soda Springs, Northstar and Squaw Valley. You'll love the array of activities either visiting in the summer or winter.